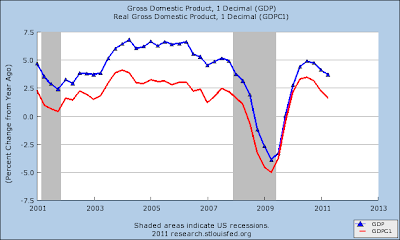 This is GDP, latest including the downward adjustments. As you can see, we managed to inflate but (cough) it came at the price of suppressing real growth. This one's in dollars, current and chained (real). 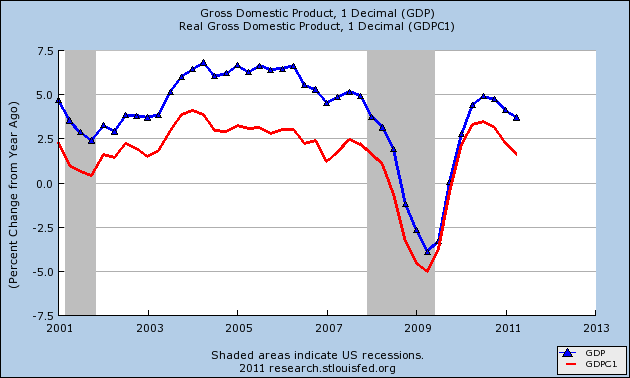 Jaggedy blue line is nominal; red is real. I thought I heard the pilot of the FedMoneyHawk whistling the Mash theme as he flew over. Suicide is painless..... Like hell. Pretty tune, daft meaning if you are not a narcissist. That's what we got going. Nutty cowardly narcissism. Oh joy. This hyah graph is the same data, scaled to first quarter of 2008. Crapola! One thing we all have to remember is that tax revenue is strongly pegged not just to real GDP, but real GDP PER CAPITA. Ya don't want to look at those numbers! However I do seem to remember Snarky Mark putting up one like that. Maybe he'll be kind and give us a link. YES HE DID. It is clear that no measures to deal with the debt were adopted because it is truly difficult to deal with the debt. When you raise tax revenue as a percentage of real GDP, you do tend to suppress economic growth. US population pyramid. Retirement costs as a percentage of GDP have to go up. But tragically, we have run out our ability to pay them as scheduled, or even 80% of benefits scheduled. We've got nominal GDP in current dollars. We've got real GDP in chained dollars. 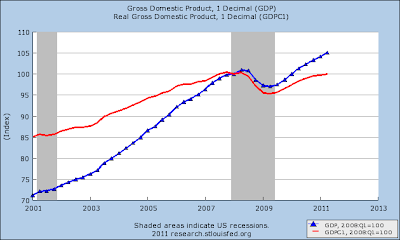 We've got a light blue line arcing up over real GDP, and that line is gross US debt. Gross US debt includes such minor bagatelles as the SS fund, the Medicare funds, federal retirement pensions.... Money that we have promised to borrow later. See Treasury Direct Debt to the Penny. That 4.6 trillion? Uh-huh. It's debt, not assets. Only Angry Saver can believe it's money. Sad. Maybe too much drugs? That's definitely DU's problem. I've added in an adjustment for the missing debt not in the Treasury figures. It's accumulated deficit that will promptly show up as soon as Congress votes and staggers out of steamy Washington. They won't linger to enjoy the applause of the crowd! These are ratios. The dark blue top line is Gross Debt/Nominal GDP. We have reached the magic 100%. 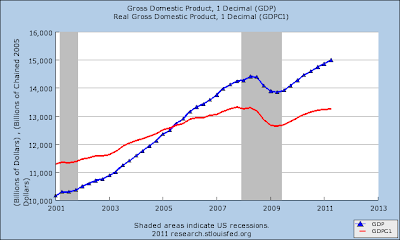 The light blue line (bottom) is Public Debt/Nominal GDP. That's why no one's worried yet. We can borrow about 3 trillion more before the money taps are turned off. And, it will stun you to know, we will have borrowed that three trillion by 2014. After that, the jig's up. The red line is really the most important. That is Debt Held By The Public/Real GDP. Two things about that. First, we appear to be very close to the tipping point of 80%. Second, after the risible performance in DC, we can all be sure that Congress has no plan not to get to that point. We could be at that point in a year, given GDP data. The reason why this is such an awful picture is that currently, there is no consensus in Washington about doing what can be done. It would require a real change of direction, because our ability to raise taxes is limited so only the growth options remain, and the growth options require dismantling a lot of legislation Congress has passed over decades. We'll reach the point at which we do it, but not until we are forced to pay considerably higher interest rates, and at that point, we'll be forced to cut social spending quite sharply. I'll discuss more about those options in a later post. This is long and grim enough. This is now purely a matter of math. If you are growing at a rate of 2% or below in real GDP, and debt held by the public is 80% of real GDP, then an average interest rate of 5% gives you 4% of real GDP each year in debt service costs, which is double the real growth rate. You can't hold the line doing that even if your primary budget is in balance (expenditures - interest = income). Well, the entire plan for retirements involved borrowing, so we darned sure aren't in primary balance. So if you then raise taxes by 2% of GDP, you cut real growth. And if you don't want to do that, and you try to inflate your way out of it, the Fed has just proven that you will cut real GDP. An economy that is over 70% consumer, as ours is, is acutely sensitive to inflation. What happens is that either tax revenues drop (if they are pegged to inflation) or we shed jobs, which drops tax revenues, raises social spending and cuts real growth. So we are in a depression, and the only way out is an IMF-like restructuring of our economy. We aren't going to pay SS benefits as scheduled, because the creditors who have already borrowed want their money, and we were planning to borrow the SS funds, but the creditors won't lend the money to us. Deflation is the only way out. And it will work, but boy it's gonna hurt. Minimizing the pain should be our goal. Just look at it. Yield on one month and 6 month the same - 16 bps, and the one year at 20 bps. What a day. I'm going to bed. Maybe some of this will make sense in the morning. UPDATE: Technically, due to the revisions we are in a double-dip recession right now. We did not climb back to previous peak before collapsing out again, which means deflation. See the bottom of page 25: Net GNP Q1 2008: 11,573.9. Net GNP Q2 2011: 11,484.1. Brought to you by Bennie. End Update. It could not have been worse. GDP, I mean. My eyeballs just burst into flames. I am in shock. Current-dollar GDP -- the market value of the nation's output of goods and services -- increased 3.7 percent, or $136.0 billion, in the second quarter to a level of $15,003.8 billion. In the first quarter, current-dollar GDP increased 3.1 percent, or $112.8 billion. That there 15 trillion is the number we are looking for, and it means that you can ignore all the chaff and we are in outright deflation. The reason the numbers are moving around is because of the annual revision. So the US is now at 100% Debt/nominal GDP ratio, including intra-governmental debt. This is not going to help Congress in its debt limit negotiations, is it? For 2007-2010, real GDP decreased at an average annual rate of 0.3 percent; in the previously published estimates, real GDP had increased at an average annual rate of less than 0.1 percent. 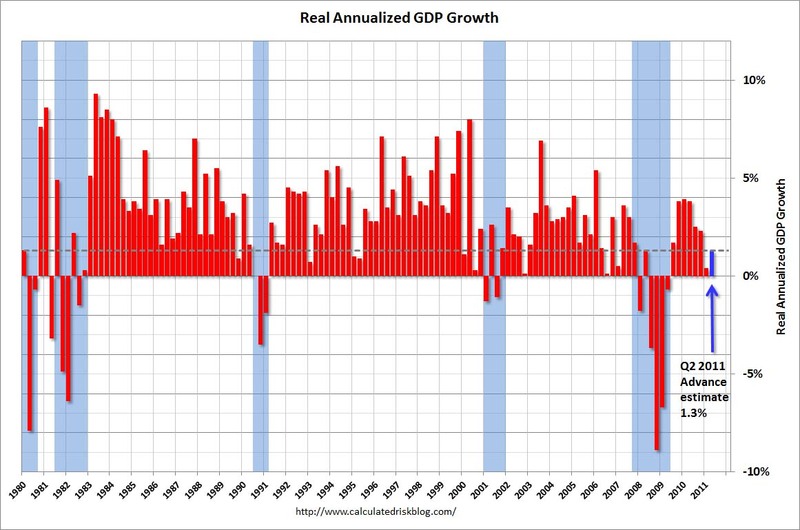 From the fourth quarter of 2007 to the first quarter of 2011, real GDP decreased at an average annual rate of 0.2 percent; in the previously published estimates, real GDP had increased at an average annual rate of 0.2 percent. The red meat in this release is in Table 12 B which starts on page 38. Q1 was revised down to 0.4%. That's annualized. Q2 is given as 1.3%. Anyone who really believes that GDP in Q2 was better than in Q1 has a very interesting mindset! It wasn't. It was worse. They have real services too high. If you go to the top of page 25 and look at real GDP, you can see that real GDP in Q2 (advance) was reported lower than real GDP in Q2 of 2008. Real GPDI is reported too high also; inflation was a lot higher than 0.4. Several years from now these figures are going to be revised to somewhere around Q1 +0.7%; Q2 -0.2%. From here we cycle up and down for a couple of quarters (the "skip") moving around zero, and then tip to some more unambiguous contraction for at least a few quarters. Unless things get worse, because they cannot get better. What's going on here is that real incomes for most of the population are still declining, and worse yet, the private economy is still cycling down in terms of real incomes. Look at Q1 2008 vs Q2 2011 at the bottom of page 25. That includes a huge input from excess government spending, which (cough) we cannot sustain. Good news we like. On initial claims, not only did we report in a week below the 400K mark, but the four week moving average fell to 413,750. That is a very big improvement and a most welcome sign. Continuing claims in the regular six-month series have essentially been stable for weeks, and this did not change this week. Continuing claims in all programs rose 320K, and I have to look into that. Last week's claims were upwardly revised again from 418K to 422K. The lower initial claims this week are not just an artifact of seasonal adjustments - they are real. This is the summer week when we shift from a positive to a negative adjustment (see weekly claims for the factors in the table), so the next couple of weeks may show a different pattern. I'm tempted to theorize here but I better not! Moving to pending home sales, they rose. There is no telling what this really means, because as this very nice CNBC article discusses, the pending home sales report has gotten a lot less predictive of existing home sales recently. This is somewhat odd, because although FHA closings are more detailed and tend to take longer, FHA has been dominating the market for a while, and we still have a lot of cash sales, which are by far the quickest and easiest to close. So that's a firm "I don't know what pending home sales means" on my part, and I am going to stand firm on that analysis, daring, innovative and bold as it may be. I have a hunch that appraisal values may be part of the discrepancy; if that is true then those sales may go through later. Alternatively it may be flat unqualified buyers, and if that is true, then those sales were never real sales. I am still expecting something of a surge in the mid-to-upper market sales that would be affected by conforming loan limit adjustments this fall. This should produce some motivated sellers willing to deal on price, because if you can't sell when it's conforming at your price, your odds of doing so when it drops out of conforming are very low. But consider what that means for creditors. You may be writing loans on homes that are going to take 100K-150K drop on comparables in six months. I would expect some caution in the underwriting market for these homes due to that factor alone. Also some hopeful sellers should be dealing hard this summer, which produces quite a challenge for appraisers, and does tend to through collywobbles into the sales market. There is currently a movement afoot in DC circles to stop the adjustment in conforming loan limits due to take place this fall. I think it is a bad idea. New homes are the most important factor for the economy. The new home market won't adjust up until the existing home market is cleared, and the only way to clear the existing home market is to let the market work by ceasing our expensive and ultimately counter-productive efforts to reinflate the slashed tire. Total products supplied over the last four-week period have averaged just under 18.8 million barrels per day, down by 2.9 percent compared to the similar period last year. Over the last four weeks, motor gasoline product supplied has averaged nearly 9.1 million barrels per day, down by 3.3 percent from the same period last year. Distillate fuel product supplied has averaged just about 3.5 million barrels per day over the last four weeks, down by 3.5 percent from the same period last year. Jet fuel product supplied is 0.3 percent higher over the last four weeks compared to the same four-week period last year. Despite all the yammering about debt, Treasuries are showing little signs of stress. That may change in a few weeks. There's a lot going on, but the trajectory of the US economy will affect longer term Treasuries and tomorrow's GDP release has the potential to move the market one way or another. Italian sovereign bonds continue dicey and weakening. I have no idea what Europe is going to do next, but they should try to do it quickly. The very real turmoil in Europe is masking some risk here in the States. Plunging rates for chartering container vessels that carry sneakers, furniture and flat-screen TVs may signal a U.S. consumer slowdown and losses for shipping lines in what is traditionally their busiest time of the year. Who'd 'a thunk? Snarky Mark! End update. Durable goods for June was less than sterling. What saved it was that orders for fabricated metal products were pretty decent, so that is an indicator of some Q3 remaining impetus. On the other hand, total new orders were down 2.1%. In April they had dropped 2.5%, and then in May they rebounded 1.9%. So this is a bit disappointing. Machinery new orders were down 2.3%. Capital goods and capital goods nondefense new orders were both down 4.1%. Most of that was in aircraft; nondefense capital goods new orders ex-aircraft were only down 0.4%. Total inventories this year YTD are up 12.3%; total shipments this year YTD are up 7.3%. Motor vehicles shipments and new orders fell 5.1% in April. In May they rebounded slightly to the tune of +0.2% shipments and +0.3% new orders. Thus, June's -1.5% for shipments and -1.4% for new orders was a disappointment, although it is explained by generally weakening light vehicles sales. I was debating whether to post what follows because it's so darned depressing, but I am seeing genuine degeneration in the WIET quick-check receipts. When I think the economy is at a turning point I often check the Daily Treasury receipts reports. A good check is to pick a comparable Monday at the end of the month and compare daily receipts. July 26, 2010. July 25, 2011. WIET is 10,705 compared to last year's 10,692. That's flatter than a pancake even before any inflation adjustments! CIT MTD receipts continue down, with current at 7,904 and 2010 at 9,622. WIET = Withheld Income & Employment Taxes; CIT = Corporate Income Tax. FUT exactly equal (quarterly receipts). Now, I just can't extract anything good or positive out of these numbers. The reason large corporations are cutting and tightening spending is because they are losing ground, which is apparent from declining CIT trends. And that is not surprising, because their costs are rising and final sales are flattening with a vengeance. Margin compression, if significant and continuing, always does cause recessions and lo! the economic law of gravity has not been repealed. How amazing. It does point up the real difficulties for Congress with the debt limit. As I pointed out, the debt limit is not really the issue. The issue is total debt and future trajectory. Raising taxes very much in a recession is quite a dangerous tactic, and it is also hard to cut spending meaningfully on social programs, so Congress is up the creek without a paddle. The US is going to face credit downgrades, and they will occur for the same reason Italy's seeing bond yields rise - declining growth projections, too much total debt, and continuing deficits. Will it do much to short-term bond yields? No, not right now. Because our current debt held by the public is what determines our ability to pay bond holders, and so far so good - we are still way below the 80% line. But if we keep racking up trillion dollar deficits each year, we have only a few years left, and very soon our ability to go out long on the bond issues will be impaired. Is the trend our friend? No. June 28th, 2010. June 27th, 2011. WIET 2011: 11,623. WIET 2010: 11,540. April 26th, 2010. April 25th, 2011. WIET 2011: 9,644. WIET 2010: 9,123. CIT 2011: 30,267. CIT 2010: 32,166. So I don't want to read any more Leadman bleeping Sachs forecasts about second half growth. And I don't want to hear any more Fed Heads yammering about soft patches. This, guys, is not mud but quicksand. And I definitely don't want to read glorious forecasts about tax receipts, because it ain't in the cards. Also - and this is where things really get painful - the ability of the US to grow exports is going to be impaired. The US dollar is going to drop, and normally that would buy us some economic impetus by increasing exports as countries like Japan and Germany become less competitive. However as far as I can see, India may already have crossed over its growth line. The picture for exports is really not that hot. Granted, China's export outlook will be impaired by the US economy. I find this no consolation. “It is not the Federal Reserve’s job to pave the yield curve with guaranteed returns for any sector of the economy, and we should not be guaranteeing a return for Wall Street or any special interest group,” he said. The Fed’s policy also “increases the risk of misallocating real resources, creating a new set of imbalances or possibly a new set of bubbles,” Hoenig said. Since when do individual Fed govs do this sort of thing? That's what's amazing! Hoenig, who is a non-voting member this year, comes out and says these things to a Congressional committee headed by Ron Paul? Hasn't Hoenig thrown red meat to the Paul tiger? Chairman Paul, Ranking Member Clay and members of the subcommittee, thank you for the opportunity to discuss my views on the economy from the perspective of president of the Federal Reserve Bank of Kansas City and as a 20-year member of the Federal Reserve System’s Federal Open Market Committee (FOMC). The role of a central bank is to provide liquidity in a crisis and to create and foster an environment that supports long-run economic health. For that reason, as the financial crisis took hold in 2008, I supported the FOMC’s cuts to the federal funds rate that pushed the target range to 0 percent to 0.25 percent, as well as the other emergency liquidity actions taken to staunch the crisis. However, though I would support a generally accommodative monetary policy today, I have raised questions regarding the advisability of keeping the emergency monetary policy in place for 32 months with the promise of keeping it there for an extended period. I have several concerns with zero rates. First, a guarantee of zero rates affects the allocation of resources. It is generally accepted that no good, service or transaction trades efficiently at the price of zero. Credit is no exception. Rather, a zero-rate policy increases the risk of misallocating real resources, creating a new set of imbalances or possibly a new set of bubbles. For example, in the Tenth Federal Reserve District, fertile farmland was selling for $6,000 an acre two years ago. That land today is selling for as much as $12,000 an acre, reflecting high commodity prices but also the fact that farmland loans increasingly carry an interest rate of far less than the 7.5 percent historic average for such loans. And with such low rates of return on financial assets, investors are quickly bidding up the price of farmland in search of a marginally better return. I was in the banking supervision area during the banking crisis of the 1980s, when the collapse of a speculative bubble dramatically and negatively affected the agriculture, real estate and energy industries, almost simultaneously. Because of this bubble, in the Federal Reserve Bank of Kansas City’s District alone, I was involved in the closing of nearly 350 regional and community banks. Farms were lost, communities were devastated, and thousands of jobs were lost in the energy and real estate sectors. I am confident that the highly accommodative monetary policy of the decade of the 1970s contributed to this crisis. Another important effect of zero rates is that it redistributes wealth in this country from the saver to debtor by pushing interest rates on deposits and other types of assets below what they would otherwise be. This requires savers and those on fixed incomes to subsidize borrowers. This may be necessary during a crisis in order to avoid even more dire outcomes, but the longer it continues, the more dramatic the redistribution of wealth. In addition, historically low rates affect the incentives of how the largest banks allocate assets. They can borrow for essentially a quarter-point and lend it back to the federal government by purchasing bonds and notes that pay about 3 percent. It provides them a means to generate earnings and restore capital, but it also reflects a subsidy to their operations. It is not the Federal Reserve’s job to pave the yield curve with guaranteed returns for any sector of the economy, and we should not be guaranteeing a return for Wall Street or any special interest groups. Finally, my view is that unemployment is high today, in part, because interest rates were held to an artificially low level during the period of the early 2000s. In 2003, unemployment at 6.5 percent was thought to be too high. The federal funds rate was continuously lowered to a level of 1 percent in an effort to avoid deflation and to lower unemployment. The policy worked in the short term. increasing their debt from 80 percent of disposable income to 125 percent. Banks increased their leverage ratios—as sets to equity capital—from 15-to-1 to 30-to-1. This very active credit environment persisted over time and contributed to the bubble in the housing market. In just five years, the housing bubble collapsed and asset values have fallen dramatically. The debt levels, however, remain, impeding our ability to recover from this recession. I would argue that the result of our short-run focus in 2003 was to contribute to 10 percent unemployment five years later. That said, I am not advocating for tight monetary policy. I’m advocating that the FOMC carefully move to a non-zero rate. This will allow the market to begin to read credit conditions and allocate resources according to their best use rather than in response to artificial incentives. More than a year ago, I advocated removing the “extended period” language to prepare the markets for a move to 1 percent by the fall of 2010. Then, depending on how the economy performed, I would move rates back toward more historic levels. I want to see people back to work, but I want them back to work with some assurance of stability. I want to see our economy grow in a manner that encourages stable economic growth, stable prices and long-run full employment. If zero interest rates could accomplish this goal, then I would support interest rates at zero. In my written testimony, I have included three speeches that describe in more detail my position on monetary policy. risk by attempting to do so. Thank you, Mr. Chairman. I look forward to your questions. You should be able to get the webcast of the testimony and responses to questions at this page. I was looking at the New Home Sales report, and all I have to report is that there's nothing to report. You know why? All the monthly numbers are so far inside the 90% confidence interval that reporting them is misleading at best. On the month over month, the reported national change was 1%, absolute value. I'm not going to tell you whether that was negative or positive, because the 90% confidence interval is +/- 12.5%, so 1% either way means "we haven't the foggiest". Turning to the monthly year over year stats, we find ourselves in pretty much the same position. The national change was 1.6%, absolute value. The sign means nothing because the 90% confidence interval is +/- 14.1%. In short, we don't know. The only YoY stat that means something is for the northeastern region, in which June sales fell 51.5% over the year. However that is misleading unless you know that the 90% confidence interval is +/- 25%, i.e, don't be too impressed. A rather small change could take that number outside the interval. Turning then to the YTD YoY stats, we note that we are still negative, but not acutely so. Nationally we are down 11.9%, with a 90% confidence interval of 4.8%. So moderately negative, but not hugely so and it's a good guess that this is flattening out. The basis for my forecast for improvement next year is that sales really cannot get any worse, and that historically after five years you do see slow improvement! Throwing any more federal money into a market this bad is pointless - we have wasted the money spent so far and we might as well just let time fix it. It will be cheaper and more effective. I now conclude this epistemological rant. This report does not matter. It will not matter this year. They say that -0.70 is the line, but if you look at where we were at the end of 2007, you can see it's a little tighter than that. At least for a service economy. Years back, you could get an inventory adjustment that would take it down without a recession, but no more. We really have been in recession for a couple of months. I have been struck by the unrealistic tone of reporting on the debt limit. It is not so much the debt limit that matters. It is whether we go on running our massive deficits that will determine whether we lose our credit rating or not. If you go Treasury Direct Debt to the Penny, you see that right now adding the Intragovernmental (trust funds = future debt) Debt + Debt Held by the Public we are at 14.3 trillion. As soon as Congress raises the debt limit that's going to pop up to 14.8 trillion minimum, and well, Q1 nominal was 15.1 trillion. So we are very close to 100% Debt/GDP ratio right now. Therefore, Treasury needed at least one Q2 GDP release to make it look better. By 2015, continuing our current trajectory, the situation will be essentially irretrievable. German ten year bunds were carrying a lower yield this morning than US treasuries last I looked. In the short term, there's no danger. But we only have a few years! So the debt limit is not at all an artificial crisis. Without real changes, we are apt to get one credit downgrade late this year, as the extent of the economic problems become obvious. If you look at the president's budgets submitted this year, they all have huge deficits. What's artificial is the president stomping around like a teenager, trying to shut down this debate so he won't have to deal with it while campaigning. He can't afford to be signing on to entitlement cuts during the campaign season, you see. But it's suicide for the country if that happens. We are not going to grow our way out of this one. It is really astonishing how a cat will find a rodent hole and just sit, motionless, for hours, only to move like greased lightning when the unwary rodent finally appears. The size of the Buyback Facility will be determined after further discussions involving the official sector. It is expected to be of sufficient scale that when combined with the €13.5 billion debt reduction through the discount bond exchange, there will be a meaningful reduction in the stock of Greece’s debt relative to GDP. This will be reinforced by Greece’s new privatization program and prospects for higher growth which should emerge as the program takes hold. Really? But the point is that the participants won't have to care much once they swap in at a loss. Official SDDS data on Greece. Total central government debt is given as 354,540, with an additional 25,525 of debt guaranteed by the central government. The total of the private Buyback is supposed to amount to around 135 billion by 2020. This does not seem big enough to me to make a meaningful difference. Take a look at that data, and see what it says to you. The May 11th central government revenue of 3,928 million with a deficit of 3,046 million implies a 50% writedown, surely? Current-Euro quarterly GDP for Q1 11 is listed as 55,538 million Euro. Anyway, here's Greece's latest report. Note that they have cut spending more than budgeted but revenue is collapsing, and this is not surprising because over the year unemployment rose to 15.9%. China's mfrg PMI in June was near stall, but today's flash has it in outright contraction. An output index at 47.2 is kind of surprising. I had expected a temporary downshift in China due to the Japanese quake/tsunami tragedy. There is a very large volume of trade between Japan and China and Japanese problems were doomed to affect Chinese manufacturing, but as those problems cleared I was expecting a relative rebound to mask the overall declining trend. The supply disruptions can no longer explain Chinese data. It is possible that power rates and supply issues might, but after seeing Singapore data earlier I think we are simply looking at the inevitable result of oil and coal prices on the world economy. European PMI is off also, but at least it is still mildly positive. By September, that may not be true; the depth of the fall is significant. The truly marked degradation in German PMI suggests a hard landing for the soft patch, with the composite down a staggering 4 points from June? Eh? France is not a manufacturing giant. French mfrg PMI at 50.1 and output at 49.7 therefore doesn't have the same implications for Europe as a whole. French services PMI is slowing although still in the 54s. I can hardly believe I wrote that hard landing for the soft patch, but all is madness. Perhaps my esteemed editors will be merciful; anyone's brain might snap when looking from a sub-50 Chinese PMI to oil prices. Somebody's crazy. Brent over 117 with European composite PMI at 50.8, down 2.5 from June? Really???????? What are they betting on, TARP II and Leadman Sachs getting 300 billion in secret, long-term, non-interest-bearing loans from Treasury to spend at ICE? Ideally this would all be a hallucination, but so far I cannot get these numbers to change by shutting the windows and opening them again. Let's turn to a slightly more pleasant subject - US initial claims. Headline is 418K this morning, with a four week MA of 421,250. This is better than it has been, but shouldn't be relied upon because we are in July; seasonal adjustments are related primarily to auto manufacturing schedules, and those are bound to be a little off because of the Japanese problems. The last week in July and the first week in August are the first real checkpoints. On a much more cheerful note, the employment base has been recalculated. The employment base is figured from state unemployment account reports approximately quarterly. In December, it was 125,845,577. In January it was 125,560,066. That was this cycle's low (compare to the previous cycle's low at 126,084,041). In April it came in at 125,572,661. In July it was reported at 125,807,389. This figure generally lags other employment figures in both contracting and expanding cycles. (After the early 80s double recessions, it first began increasing again in 1984) It is a very "real" number; but it has the distinct effect of popping up right before a downturn. I have always thought this is because better uptake of part-time jobs due to cash-strapped workers. Of all the primary employment numbers, it is the most unbiased in one respect - it is not a sampled figure! It does seem to support NFIB's theory that July should show slightly better employment stats. The peak in the last cycle was in Q4 2008 at 133,902,387. We are still off eight million jobs, and we appear to be heading down again. This number should peak in Q4 2011, unless a miracle happens. Philly Fed billed as "neutral" - workweek drops from June, inventories increases, unfilled orders stick, number of employees mildly up, prices paid index drops a little, but prices received drops more, shipments steady. Future expectations much better, but those change quickly. Yesterday's Census report on new construction kind of supported not an uptick forecast, but the idea that next year there would be an uptick in home building activity overall. For years I have had 2012 pegged as the real year when residential construction activity would rebound! By "uptick" I mean a growth in the real value of construction, which has not yet happened and will not happen meaningfully this year. Note that this report is NOMINAL, rather than real, spending. And still it stinketh to the high heavens. The only thing that could accurately convey the true suckiness of these figures would be if Sarah Palin picked up a CNBC announcer's position, and reported the figures each month dressed in a Princess Leia outfit. For May's report she would say something like "I thought I recognized the foul stench of another declining Value of Construction report this morning, and we've just received the figures and I was right!" Then she would pull out a light saber and whack an arm or a leg off whichever poor dolt the administration had sent out to spin it, and we would all cheer. By which I mean to tactfully hint that most analysts are misreading the new construction report. We'll know it's really crossing over when the "under construction" figures stop falling YoY (-6.3% in this report) and when quarterly SA completions stop plummeting (completions were down 39.3% YoY in yesterday's report). Because of financing difficulties, the pace of construction on a lot of "started" multi-family projects may be quite minimal right now. You often move some dirt to preserve your authorization/permit, but you may not be building very fast. Toward the end of the project you are building fast and they always advance the funding, because they are close to turnover and delay does not serve the creditors' interests (absent a total collapse). Thus right now completions mean more than starts on multi-family. Against that hopeful 2012 outlook, the issue of the Oct 1st cut in conforming loan limits is a counterbalance. It's much more serious than most think because it will deliver high loan portfolio losses for several years after, and because it is concentrated in certain areas and in a certain price segment of loans. Because of the concentrated nature of the effect, it will greatly tighten underwriting standards for new home loans at certain price levels, so it is bound to negatively influence new single-family construction. For the next few months, the pending conforming loan limit changes will skew the total sales mix toward high-end, and so will produce apparent price increases in the NAR reports. Look at the skew between single-family and condo/co-op sales in the Existing Home breakdown to see what I mean. Those price increases aren't real and are going to reverse themselves in an epic implosion by February of next year. So today's Existing Home Sales report is an important third leg of the residential construction piece. And it is disturbing. First, on a YoY NSA basis national home sales are down by 8.5%. On a month over month seasonally adjusted basis, home sales dropped slightly, gaining only in the southern region. But more more serious, months of supply ramped up to 9.5 months from 9.1 last month. In June of last year it was at 8.9 months. Now, taking all this together, my long-held forecast (since 2007) that residential construction would start being a reliable growth edge beginning in 2012 is in deep jeopardy. In fact, I think I just dumped it. This is a crushing blow, and if I had not spent three hours last night scrubbing and bleaching I would probably be wandering in circles calling upon the Almighty for strength. Why is this a crushing blow? Under the circumstances it is quite dire, because even the most optimistic economic forecasters with any credibility realize that falling real wages and rising real unemployment do not auger well for final demand next year. In particular, they are extremely adverse for MV output, which always moves the economy. The wondrous thing about residential construction and its huge relative contribution to recovery cycles is that it is countercyclical. First, it is never a mass-market, average effect. You only need a very small net percentage of the population willing to build new or buy new to produce a large relative growth vector to the economy, including moving a lot of material and generating a lot of jobs. And yes, we currently have high unemployment, but there is always ten percent of the population which is doing quite well (there were even in the GD), and they tend to take advantage of their opportunities for cheaper financing and higher buying/building ops to build or buy. In fact, the entire success or failure of the Bernank's "blow an asset bubble" plans depend on whether those with a lot of assets use the money to invest in residential construction. OOOOOOOOOOPPPPPS! Now, rising unemployment is very bad for new car sales, which are a mass-market deal. And I have already acknowledged that we are in a cyclical downturn, so the hope of having a short cycle do now depend on next year's residential construction outlook. I mean, let's face it, we aren't going to be building strip malls and car dealerships, are we? As for Crude Inventories. Ain't nothing there. Four week distillate demand has rebounded to -2.5% YoY. 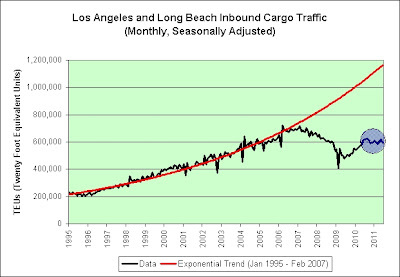 This is a relative improvement, but it is almost surely due to heating oil buys rather than higher trucking activity. Gasoline four week demand just fell hard to -2.2%. This is the lowest level so far this year by a stretch, but I'm wondering if it isn't due to Carmaggedon in LA. I expected that to produce a noticeable shift in demand, so I expect it to reverse to near previous levels. I could be wrong, but not only do they have plenty of cars out there, they drive them. A lot. For long distances. In traffic. Wasting gas. Crude stocks fell by 3.7 million barrels, but it turns out that total commercial petroleum + product inventory increased by 3.8 million barrels. Also, we reached a landmark; four week net imports of crude and petroleum products is down by 10% YoY versus -8.9% YTD YoY. Four week domestic production is up 3.7% versus YTD of 2%. The rest is in lower consumption. If we opened up Alaska AT ALL we would be up by over 10%. "The 'bugbear' is that we are still unsure about the precise reasons for the slowdown in 2011 to date, which is sharply at odds with our expectation at the end of last year that growth would accelerate in 2011," Hatzius writes. That blue line is the rate of change each June in nominal wages compared to June 2007. (Because HI is a straight percent of all wages and salaries). The nasty orange-red line is the rate of change each June of CPI-W adjusted wages compared to June 2007. So offhand I'd say the puzzlingly slow rate of final demand increase can safely be imputed to lack of real income. There are other factors. Many SS recipients are low income. They did receive a 5.8% COLA for 2008, but that was due to prior inflation. CPI-W understates this type of inflation severely for low income SS recipients due to a misallocation of spending percentages and due to the fact that they are already on the low-cost tiers without the ability to substitute. So since then they have lost ground, and they did so very rapidly this year. Then there's the expiration of unemployment benefits. The max in this downturn was 99 weeks or 23 months. Not everyone qualified for that, though. The highest rate of initial claims came in the first half of 2009, so a very large proportion of those claimants have lost benefits by this summer without being able to find any work or any work paying nearly what their unemployment benefits did. Every month they are still falling off the rolls. Finally, let's take a look another look at wages and wages ex supplemental benefits. The large increases many employees are paying in the form of increased deductions for medical insurance are not reflected in a reduction of HI receipts, because that is considered consumption. But certainly to the employee who gets less in his or her paycheck, it is an income cut. This too weighs disproportionately on lower paid workers. Even if the Bush tax cuts had never happened, it is clear that the relationship between personal income taxes + FICA and government transfer payments has veered off in a new and frightening direction. It is non-sustainable. The killer is that a huge new entitlement program paying subsidies for medical insurance and vastly expanding Medicaid is due to kick in at the beginning of 2014. The top intimidating blue line is SS, Medicare and Disability. Other (the shadow) includes Medicaid (a lot goes to older poor people), food aid and the like. The little yellow camels at the bottom are unemployment insurance. Vets and traditional type welfare hardly register. There's an election on in France, and all the candidates agree on tightening up the fiscal stance. This is quite a shift from last year and even earlier this year. The odd thing here is that the primary Socialist candidates to replace Sarkozy are committed to undoing some of his changes, so they do not explain how they will carry on the government belt-tightening. Continued pressure on European sovereign bonds might explain this. Australia got itself into the consumer debt bind a couple of years ago, and its economy is now paying the price. But the fundamentals aren't that bad, so the normal central bank move would be to drop rates. I think they are going to have to do it. I was coping with all this until I made the mistake of looking at weekly rail. Carloads YTD YoY are down to +2.5%. That may not sound bad, but it is a huge relative decline over the last month. If you are in a depressed mood I wouldn't read the weekly update. Over the last month: 3.3% > -0.2% > 0.3% > -3.2%. It looks like whatever springback we were due for from the previous auto supply shortages is over. Truck inventory has been building up, so I think domestic light vehicle production is going to tail down a bit. Also, at the beginning of the four weeks past period intermodal YTD YoY was up 8.2%. Now it is up 7.5% - having decisively entered the declining trend. I have read the GS latest, and I view it as overoptimistic to a lunatic degree. Everything I see points to fundamentals that are worsening rapidly in the third quarter. There is a mystery here, and it is how we get such a tightly coordinated and synchronized movement. So far all my scratching around has only served to convince me that the movement is real. Until I truly understand the reason for what is an unusual degree of correlation, I do not want to go forward. There are considerable knock-on effects for banking. Retail commercial mortgages are ugly, losses on residential mortgages are rising, FHA may be in deep trouble, and needless to say, credit card debt is going to degenerate. Therefore, I am going to stop blogging and do a detailed vector analysis. That usually serves to clarify things. Foo is no longer blathering, but has now decided that we should deport people who cannot support themselves without aid of government programs, including SS. If one adopts a pure utilitarianism, this is a valid way to deal with our fiscal problems. I do not, but at least Foo is now advocating something that would save money. Admittedly, this is basically a Nazi solution, but the widespread starvation and fighting over food prevalent in Germany at the end of WWI and after spawned the Nazi era (people were crazy with fear that it would happen again), so in one way Foo is merely going directly to the logical endpoint. Setting aside the constitutional changes that would need to be made, the obvious constraint of not having a place to deport them to remains. After considerable thought, I have decided that we should conquer New Zealand and deport them there. NZ will be very cheap to conquer and relatively cheap to hold, and it is far enough away that people will have trouble returning. Nor will the screams of the dying bother us. It is remarkable that we are discussing problems that were prevalent in the 1700s and 1800s in England. The Poor Laws of England dated back to the Elizabethan era formally (brief historical summary), but had been modified in 1723 to start parish workhouses (never popular locally due to competition with local business owners), then modified in the 1790s by reformers to add supplemental relief in many parishes (for workers with inadequate incomes). There was a system by parish of providing either work or subsidies (subsidized rent, sometimes bread, occasionally money) for the disabled, the unemployed and the employed not making enough to live on. In 1832 a Commission of Enquiry was appointed to change the system, because the system was supported by a compulsory "poor tax" and the rates were felt to be burdensome. The whole 1834 report was rather long, and I had quite a search before I found it. If you bother to read it, you'll see that our current system of EITC is not original. As a result of the 1832 commission (the result was predetermined), out-doors relief was banned and a system of workhouses was implemented in the 1834 Poor Law. The result was to make being poor essentially a crime punished by imprisonment. Spouses were separated so they couldn't reproduce and children over seven were separated from their parents. Both children and adults were forced to hard labor. It did not last that long as a system due to public repulsion. The poor often simply turned to begging or crime due to their deathly fear of accepting that type of assistance. The prison ship system and the last large wave of Australian deportations coincided with the economic changes which began in the early 1800s and made the old parish system unworkable. After the 1740s the population of Great Britain rapidly increased and a labor surplus had developed. This development coincided with the Enclosure Acts, which displaced a certain amount of the rural population, but did make it possible to feed a larger population. The more things change, the more they remain the same! PS: The economic benefits of creating a labor surplus coinciding with the economic cost of preventing societal breakdown are best understood by looking at the development of the English Poor Laws. In many, many ways you can see the push and pull of landowner and later manufacturing interests against the interest of workers. With Reagan's amnesty in the 1980s, the US embarked on a course very similar to that of England after 1750. Marxist doctrine really derived from English history; stupid as Marxism is, it did address the societal push and pull of labor and poor regulation that began after the plague years of the 1300s. Those who need to employ labor always are interested in maximizing its supply and minimizing its costs; however the property depredations that ensue due to sheer deprivation force public subsidies of labor, and the result is then a public rebellion against the cost of subsidizing people who can't support themselves. Mark had done an earlier one of these that picked the downturn up in nearly real time, right at the beginning. I put this up because it proves that Mark is not just snark. I like Mark's graphs - they are about economic gravity. Maybe we need to make all those unemployed physicists out there handle the economics, because the current batch of economists seem on the main to be wandering around in a virtual world. Now, although I like Mark's graphs I do not like their current content, so if I were really a Marxist, I would of course decide that Mark was the problem. But I am not, so I am forced not to rant about Mark but mourn the underlying economic realities which his graphs suggest. In fact, let me point out that if you do not like the extraordinarily unhappy economic realities I discuss, and you attempt to attack not my facts but my conclusions as being based on wrong-thinking, then you are the ideological Marxist. AAAAHAHHHHHH,.Cue footage of screaming, running, buildings collapsing. A) On a seasonally adjusted basis, June Other Deposits grew at the rate of 20% annualized. 20.1%, to be exact, but when the numbers are this large you can certainly dispose of the second digit, much less the third digit - it only improves accuracy. B) The true excruciating extent of the consumer financial debacle can only be completely understood when one observes that revolving credit (CCs) grew in June at the annualized rate of 9.9%. Tragically, before yesterday's H.8 release I had been wondering if the marked growth in Other Deposits wouldn't redress the consumers position somewhat and provide us hope of a short recession. Well, that is not going to happen, because a lot of people are running up their credit cards to live, so the overall numbers are going the wrong way! I need psychotherapy to deal with these numbers. Or alcohol. This is unmitigated financial disaster that is not unkinking itself. Believe me, there is no better living through consumer credit when you are getting 1% on your savings and paying 9-12% on your CCs, plus charging your monthly living costs on your CCs. This, btw, explains why June's retail report was just flat, rather than declining as Other Deposits suggested. The difference is in credit. Which is not sustainable! Money - it flows like water. Like a flooded river, sometimes it flows over a nuclear plant. When that happens, it is not good. About all I can see that the European bank stress tests can achieve is to weed out those bankers with hypertension problems, because the conditions set up certainly don't test for the financial stressors most worrying investors. So breathe deeply and remain calm, and don't walk under European bank buildings that still have windows that open. US: CPI for June: There are three measures of CPI published. The first, CPI-U, is considered to be an overall. The second, CPI-W, is a measure of consumer prices for lower-income workers. This is the index which by law is now used to adjust Social Security. The third, a new one, is C-CPI-U, which is like the first except that it has more substitutions. The proposal to switch from CPI-W to C-CPI-U to calculate SS COLAs would have a very adverse effect on lower-income retirees in the future. Over time, the real value of their SS checks would drop very significantly indeed. I view this as a strikingly stupid proposal, and I have not seen it discussed honestly anywhere on an economics site, so I thought I'd mention it now. The biggest part of the difference between the proposed adjustment index and the current does not come from a more accurate inflation calculation, but from a shift in the income base used to assess expenditure categories, i.e, assuming that retirees have higher incomes than they do and calculating inflation on a fantasy basis for them. The average Social Security check is less than $1,100 still. It's three hots and a cot money, and pretending that you are measuring inflation for retired households with average incomes of 50K is dimwitted and deeply dishonest. Even if that were true, medical costs have a higher inflation rate than the rest of the economy, and retirees spend far more of their incomes for medical expenses. So CPI-W already underestimates the inflation rates real retirees experience. CPI-U really understates it - it is hard to eke out hedonics when you are living on rice and beans. The next generation of retirees are going to be much, much poorer than the current generation, on average. This will be true for a number of reasons, including, but not limited to, poor finances of state and local governments which will continue to raise the cost of local government charges and taxes, much lower defined benefit pension participation rates, lower average real salaries among the working class over the last couple of decades, a shift in cost patterns to rising basics (the retail efficiencies are worked through and dropping, and higher energy prices), an implicit drop in Social Security involved in raising the full retirement age from 65 to 67 (hits at lower income retirees much harder), changes in the way Social Security benefits are calculated to lower average checks, and changes to Medicare which will raise retiree medical costs and lower benefits. In short, all but wealthy retirees are already screwed. Aside from the morality of this proposal (lacking), I view it as strikingly stupid because it will actually raise retirement costs to the government. Not only won't it save a penny, it will cost the government MORE money than it otherwise would. Why? Because so many retirees are going to wind up so poor that they will qualify for extra benefits such as Medicaid and food stamps, and quite a few will get Section 8 housing. If you shift a third of the retirement population into this income strata, it is going to amount to a per-retiree additional retirement benefit of over $300 a month in current dollars. It could well be more like $500 dollars a month; what will happen is that by the the second decade of retirement most older people will wind up in this bucket. On average, their medical expenses are much higher then, and so Medicaid finances would be deeply strained. So let's not be jerks, okay? Barring shooting older people and burying them in mass graves, we are going to have to continue retirement programs pretty much as is for all the poorer older people. There is a reason why the Simpson-Bowles Commission recommended raising Social Security stipends for the poorest retirees, and it wasn't because of a sudden outbreak of fiscal irresponsibility. It's because it is the cheapest way to do it. Empire State Manufacturing Survey. The current business conditions index was still negative. However that is not as dire as the big collapse in the average work week (-15.56) and the drop in unfilled orders (-12.22). There is a glimmer of hope for the future in that inventories went negative and shipments were up marginally, but new orders also dropped again (-3.61 > -5.45). So this is not an encouraging report overall, and the word "unexpectedly" was trotted out to describe it. Industrial Production for June: The headline is +0.2, but in fact this is a strikingly negative report. I expected it to be bad, but I am somewhat confounded by these numbers. They do get revised, and perhaps they will look a little better next month. June also completes Q2, and when you look at the progression for the quarter the truth sinks in. Manufacturing has been a bright spot in this recovery - until now. The weakness in the consumer economy is showing up - it has been for some months. For the quarter, production of consumer goods is negative (-0.1 > -0.3 > 0.0). Over the year, +1.4. Manufacturing as a whole was flat this month and negative for the quarter, but previous strength still gives us an annual rate of +3.7. Capacity utilization hasn't improved much - for the year overall it is +.4 at 76.7, well below the 72-10 average of 80.4. Manufacturing is now flat for the year. Of particular concern is business equipment, which had been very strong but came in negative for three of the last four months. Output for the second quarter as a whole moved up in most of the major market groups, although the production of consumer goods decreased at an annual rate of 1.2 percent. Declines in the output of consumer goods occurred for both durables and nondurables. In June, the production of consumer goods was unchanged, with a decline of 0.5 percent in durables offsetting an increase of 0.2 percent in nondurables. Among consumer durables, lower production of automotive products; appliances, furniture, and carpeting; and miscellaneous goods more than offset a small gain in home electronics. Within consumer nondurables, the output of non-energy nondurables was unchanged; increased output of chemical products was offset by declines elsewhere. The production of business supplies rose in June after having declined in both April and May and was little changed for the second quarter as a whole. For the second quarter as a whole, the manufacturing index edged up at an annual rate of 0.2 percent, a notably smaller gain than in any quarter since the recession ended in the second quarter of 2009. The index for nondurable manufacturing increased 0.1 percent in June; higher output of textile and product mills, petroleum and coal products, and chemicals slightly more than offset lower output in other nondurable categories. For the second quarter, nondurables output decreased at an annual rate of 0.2 percent. Production in the non-NAICS manufacturing industries (logging and publishing) decreased 0.5 percent in June and dropped at an annual rate of 9.4 percent for the second quarter as a whole. In June, the production index for utilities increased 0.9 percent; its operating rate rose to 79.5 percent, but that rate remained 7.1 percentage points below its 1972--2010 average. Last, but not least: July 1st Reuters/Michigan Consumer Sentiment released its June summary on July 1st. 71.5 was the headline. The midmonth for July was released at 63.8 this morning. Another unexpectedly. A drop of this magnitude strongly suggests recession. March 2008 was about 69. Today's measure was way worse than anyone expected, but if you look at H.8 it wasn't surprising at all. This preliminary measure is the worst since we were still in recession in the second quarter of 2009. PS:: gas is back up over 314 - this isn't going to be helping consumer sentiment this summer. H.8 should be updated late today. I forgot - The Liscio Report is showing the sudden deceleration of sales tax receipts in states, with 82% meeting goals in May and only 58% meeting goals in June. This is the flipside of the H.8 Other Deposits recession signal and the remarkably poor Michigan survey. Needless to say, this contraction is going to hurt state finances badly. This recession has been on for a few months - you don't get these results the first month. July is the third month. Nothing Another Bubble Can't Fix? I feel like I'm caught in some sort of sci-fi movie. One of those where the hapless protagonist gets caught in a time loop, and has to repeat the same sorrowful series of events over and over again. Based on advance estimates1, the economy grew by 0.5 per cent on a year-on-year basis, down from the 9.3 per cent growth in the previous quarter. On a seasonally-adjusted quarter-on-quarter annualised basis, the economy contracted by 7.8 per cent, compared to the 27.2 per cent expansion in the previous quarter. The reason why you watch Singapore is that it is kind of bellwether for Asian trends. That is quite a shift. That is all. Beam me up, Scottie!!! I'm not goin' through that big rock gate! Fannie Mae launched a new product onto the secondary markets Wednesday. The shorter duration issue of three-year benchmark notes are being consumed by money mangers desperate for liquidity. The 30-year Treasury auction went just fine. Treasury Auction report. Yields came up after the auction. This article has more detail. Hoo Hah! An Italian Lunch! If I'm not mistaken, Ron Paul just took out longer Treasuries. It is also bank reporting season, which doesn't help. Notice the pattern on the Treasuries with the short yields dropping (flight to safety) and the long yields rising. There is nothing like a US Congress Critter announcing that the US is insolvent to generate confidence in the currency. He came very, very close to saying that Moody's should already have downgraded our credit rating regardless of whether the debt ceiling is raised. The Bernanke/Paul feud is about to get even more heated. Oh, yeah, and Bernanke says "I didn't mean that!" (Added) This immediately put pressure on oil, although all the theorists are still crawling around claiming that bond purchases have nothing to do with oil prices. See, they raise stock prices, because those are special assets, but commodity prices are a different thing altogether! Among the specials on today's banking menu are commercial mortgage mystery meat patty w/ covered bond gravy, but I recommend the Texas/Italian fusion cuisine offering of Pasta Paul-Tremontino with a side salad of bruised munis (you can't have this move on Treasuries without further pressure on the so-so munis). I have been following the green energy/no nukes progression in Germany. The current situation is that they have to build new gas and coal plants to replace the loss of energy supply from the nuclear plants. But they can't build them quickly enough to avoid blackouts, and they can't afford to build them. So if you go to that link, they are tapping climate funds to build new coal plants. Germany doesn't have the transmission capacity to route the power around to make up for the shut nuclear plants, so it is using portions of grids in neighboring countries. Everybody is suing everyone. The Greens are complaining about power prices, because they just don't grasp the fact that the production cost of wind has nothing to do with the cost of incorporating a very highly variable power source into the grid. The Greens are also very unhappy about the new coal plants. The neighboring countries are very unhappy because when winter hits, Germany's transmission problems may cause them problems - their lines will be flooded and they might face blackouts themselves. The auto companies in the south are very worried because they may be forced to shut down this winter to conserve power. Oh, yeah, and just look at where Germany's household electricity rates are. And they have to go higher! The entire boondoggle in Germany would make an Austrian economist weep buckets. The way for a German household to escape the high electricity costs is to install solar panels. They do not produce much power in Germany due to low insolation, nor do they match well with overall yearly power needs (although they are pretty decent with daily peak in summer), but they do make money for the household because the utility is forced to buy the power at 54 cents a kwh. Now, if you have to buy at more than twice the rate at which you sell, something's gotta give, so the utilities distribute that subsidy in the form of charges to other households. That boosts the cost of their energy, and encourages them to do the same thing. The feed-in tariff for new solar projects was reduced this year, but these costs are guaranteed for decades by German law, so Green power is damned expensive power for German consumers. Anyway, I don't have time to cover this topic thoroughly, but it is one of the reasons why German retail sales have been so poor. This will cost the German economy for decades. It's sad, because Germany was just coming out of a very long period of suppressed economic performance due in large part to reunification costs. The entire situation is highly regressive. Energy mistakes are one of the things that destroy economies. The German economy is particularly vulnerable to high energy costs because it is reliant on heavy manufacturing. However Germany's idiocy is quite good for the Poles, the Czechs, and possibly the Hungarians. It is likely that more heavy manufacturing will be moved from the country to the eastern bloc. The rise is too much. A 1.8% rise in inventory and a 0.2% drop in sales on wholesalers means that manufacturers' inventories were heading into trouble. April was less of a problem. It is unlikely that wholesalers will continue to build stock at this rate. We did see this show up in order backlogs on various manufacturing surveys. The next urgent decisive factor will be light vehicle sales at dealers for July and August. See the next post below for the rest of today's action. ... I might have found my missing 90K jobs. I am convinced they are out there, because I saw the pop in MV shipments on rail, and cars just don't conjure themselves into existence. Also Monday transmittals on the Daily Treasury Statements late in June looked pretty good, so maybe they missed the survey week and will show up in July's employment report. I'm working through today's reports, all of which look to be error-bar-ish. Weekly initial claims (this crosses the July 4th holiday and there are way more than the normal estimates, so it could change quite a bit next week). Also there is a potential issue with seasonal adjustments, because of the normal July MV shutdown cycle which may be off this year. But regardless, the four week moving average of claims is still pretty much in the same 425K range, although on the low side (423,250), but the downside is that the previous couple of weeks were revised to the high side. Also I am disappointed that the continuing claims four week moving average is now inching up - this is not a good sign. H.8 will tell us where this is going to go, but the June retail report doesn't look like consumers feel secure. 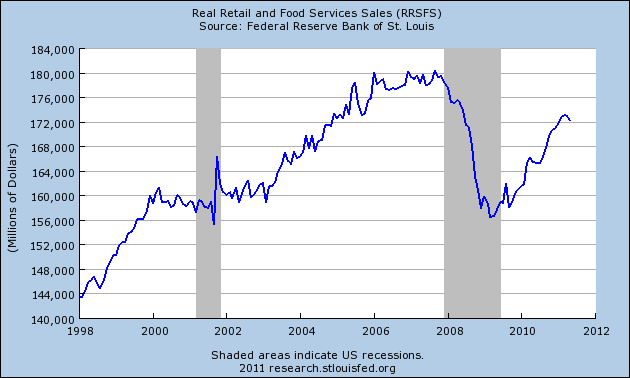 I am hoping for a skipping recession - that's what the stores look like. In theory, you can't have a skipping recession in an economy as biased toward services and consumption as ours, but you know what? In theory you can't have a recession this quickly after a deep recession, so maybe it's just time to throw theory out the window and rely on evidence. Skipping recessions are quite common in production-weighted economies, and they are not necessarily a bad thing at all. They prevent much worse downturns. The general pattern is that inventory builds up a bit, there is something of a coordinated slowdown for a couple of months, and then it pops up for a month or two, and then it cycles down a bit. Overall until the causative factor is addressed the general trend is down, but it is so slow and gradual that there is time to adjust (usually in pricing/efficiencies), and so a major downturn is avoided. You kind of knock out the last third of the negative spiral effects, which helps a lot. They are slow adaptations. All I can say about today's retail report is that there were only marginal improvements in auto sales from May, which is not too good because in May inventory was more of a retarding factor. Given the month-to-month error, the low sales in grocery stores and pharmacies probably are a better indicator of the future three-month trend. Groceries came up a bit, but pharmacies went negative. The doughnut hole and reduced senior real incomes appear to be exerting some real drag on sales. Last, but not least, the Producer Price Index was published. The twelve-month change in crude goods is at a new high of 26.2%. The twelve-month change in intermediate goods is at a new high of 11%. The twelve-month change in finished goods dropped from 7.3% last month to 7% this month. I have a hunch that may not hold. If it does, then it is an indicator that we are in a recession, but I suspect that Bernanke's groping of Mr. Market's private parts yesterday may have an influence here. Unfortunately, taking the retail reports together with the PPI implies that the Bernanke market wedgie may only push us from a skipping recession to a more traditional recession. I do not like this, so I am fantasizing about putting Howard Davidowitz in the steel cage with Bernanke. Two go in, one comes out, and let's face it, Howard would come out waving Ben's severed head in triumph. As always, we are looking at Hospital Insurance Medicare receipts, which are paid on all wage and salary income, no matter how high. Thus this is a good way to determine nominal money flowing through the economy from employment. The data is available on page 7 of the following treasury releases: June 2011; June 2010. We are losing nominal ground fast - just a few months earlier, we were up 5% YoY on the total. The major impact so far is on the self-employed, which is not surprising right now. Obviously real wage and self-employment income is down by more than 2% YoY. This probably accounts for why two-thirds of the public believe we are in a double-dip recession. Just as a reminder, in March wage receipts were up by over 6% YoY. April was the last comparable month on the self-employment income: April 2011. April 2010. Self was almost exactly the same back then (of course that is net over the year). So there has been a sharp degeneration over the last few months for those businesses (some of that may be retirements/shutdowns). YoY wage trends in May were +2.947%, compared to June's +2.898%. My conclusion, which need not be yours, is that my theory on the service businesses is correct. That is, they are being starved due to declining real incomes for a large number of households, and that they will be a major factor in cutting final demand over the next six months. It takes some real strong impulse to produce these sudden reserves of cash in bank accounts. Another sign of the times from the June Monthly Treasury Statement is that corporate income tax receipts in June 2011 were 50,594, compared to June 2010's 56,529. Million. Look up at the top of page 6. That is -$5,935,000,000 in corporate income tax receipts YoY. There was a lot of talk about the June employment report and seasonal adjustments, but I believe if you look at the trend of wage receipts, it appears that the employment trends shown in the Household survey are real. Needless to say, these numbers have negative implications for state financing. Property taxes are generally the most important local revenue stream, but sales and income tax changes hit the states hard. The mechanism here is declining margins and declining real incomes for most households. In an attempt to make it all better, Bernanke was trying to explain to Congress this morning that the Fed would do whatever it needed - fight inflation or fight deflation (my interpretation). The market took away the imminent appearance of QE3- a disaster movie coming to a theater near YOU in August, and promptly dropped the dollar and bumped up oil prices to the high 90s and gasoline wholesale to 314.40. So expect inflation to keep giving the above results. The market is trying hard to heal itself right now, but it seems like the good old country doctor he might have the wrong diagnosis, and given what he described as his reason for thinking the problem was temporary, followed by the result of his statement, he definitely hasn't written the right prescription! In part, the recent weaker-than-expected economic performance appears to have been the result of several factors that are likely to be temporary. Notably, the run-up in prices of energy, especially gasoline, and food has reduced consumer purchasing power. In addition, the supply chain disruptions that occurred following the earthquake in Japan caused U.S. motor vehicle producers to sharply curtail assemblies and limited the availability of some models. Looking forward, however, the apparent stabilization in the prices of oil and other commodities should ease the pressure on household budgets, and vehicle manufacturers report that they are making significant progress in overcoming the parts shortages and expect to increase production substantially this summer. Once the temporary shocks that have been holding down economic activity pass, we expect to again see the effects of policy accommodation reflected in stronger economic activity and job creation. However, given the range of uncertainties about the strength of the recovery and prospects for inflation over the medium term, the Federal Reserve remains prepared to respond should economic developments indicate that an adjustment in the stance of monetary policy would be appropriate. On the one hand, the possibility remains that the recent economic weakness may prove more persistent than expected and that deflationary risks might reemerge, implying a need for additional policy support. Even with the federal funds rate close to zero, we have a number of ways in which we could act to ease financial conditions further. One option would be to provide more explicit guidance about the period over which the federal funds rate and the balance sheet would remain at their current levels. Another approach would be to initiate more securities purchases or to increase the average maturity of our holdings. The Federal Reserve could also reduce the 25 basis point rate of interest it pays to banks on their reserves, thereby putting downward pressure on short-term rates more generally. Of course, our experience with these policies remains relatively limited, and employing them would entail potential risks and costs. However, prudent planning requires that we evaluate the efficacy of these and other potential alternatives for deploying additional stimulus if conditions warrant. On the other hand, the economy could evolve in a way that would warrant a move toward less-accommodative policy. Accordingly, the Committee has been giving careful consideration to the elements of its exit strategy, and, as reported in the minutes of the June FOMC meeting, it has reached a broad consensus about the sequence of steps that it expects to follow when the normalization of policy becomes appropriate. In brief, when economic conditions warrant, the Committee would begin the normalization process by ceasing the reinvestment of principal payments on its securities, thereby allowing the Federal Reserve's balance sheet to begin shrinking. At the same time or sometime thereafter, the Committee would modify the forward guidance in its statement. Subsequent steps would include the initiation of temporary reserve-draining operations and, when conditions warrant, increases in the federal funds rate target. From that point on, changing the level or range of the federal funds rate target would be our primary means of adjusting the stance of monetary policy in response to economic developments. By dumping the dollar and buying oil, thus negating the "temporary" factors. I am not sure the market was wrong to do so. On the one hand, Dr. Ben testified that he expected prices to drop. Here he appears to be saying that if prices do drop, he's gonna rev up the BlackMoneyHawk and make some more flights over Manhattan. Due to the fact that I anticipated a possible depressive episode, I had cracked open the emergency dark chocolate candy bar stashed in the freezer and ate two squares with a glass of nonfat milk while reading this testimony. I think it is worth reading, because I found it rather comical thus fortified. Your sense of humor might not be the same.